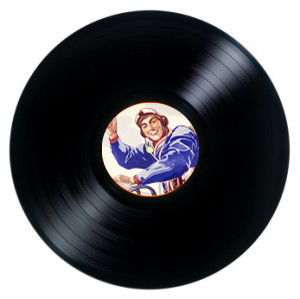 Front-side of vinyl record shown. Special Containment Procedures: SCP-1717 is to be kept in a polyethylene 30 cm-1.5 mm protective sleeve to prevent dust build-up while contained in dedicated storage locker #4 at Site 62. Personnel believed to be in possession of content from SCP-1717 are subject to advanced interrogation procedures followed by administration of class B amnesiacs if no subsequent media is found. Staff found Any storage containing an instance of SCP-1717 is to be incinerated immediately upon acquisition. Requests for testing SCP-1717 should be addressed to Dr. Barrows. Description: SCP-1717 is a vinyl record of indeterminate origin. It was originally brought to foundation attention after Upon study no unusual elements were detected within it's composition, however the pilot sticker has been glued over the original label and thus far has been inseparable.